If you follow MyDomaine closely, you'd know that we're big fans of Jeremiah Brent. We recently featured his stunning L.A. home with his husband, Nate Berkus; adorable daughter, Poppy; and son, Oskar. We died and went to creative heaven at seeing inside his home pottery studio, and we swooned over his re-design of our editor's small NYC apartment. So naturally, when he was tasked with rethinking what a beauty boutique looks like for clean skincare brand, True Botanicals, we knew it would be good. As per usual, Brent managed to exceed our expectations with the brand's new San Francisco concept store. The 1800-square-foot boutique will double as an event space and a place for women to gather and connect. For Brent, the brand ethos and aesthetic provided ample inspiration for the store design and you can see that in the organic materials, shapes, and textures used throughout. "We aimed to create a space that felt layered, holistic and rooted in the ceremony of self-care and self-awareness," he tells me. "The brand exudes a playful sophistication, and we really wanted to translate that energy through the interior design." Read on to take the tour and hear more from Brent and True Botanicals founder Hillary Peterson. After seeing how retail has transitioned in recent years, Brent wanted the True Botanicals store to be entirely experiential. "Everything introduced is meant to evoke the quintessential California lifestyle," he explains. 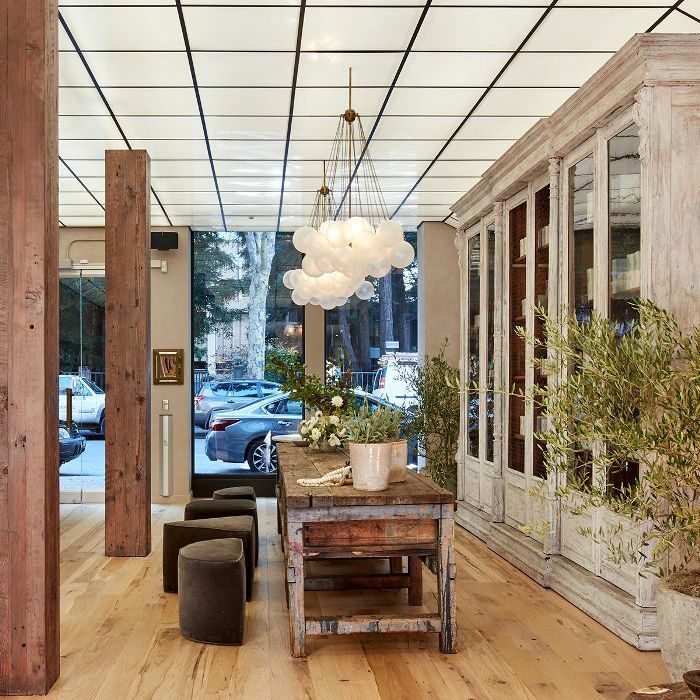 He wanted to blend honed marbles, reclaimed materials, old salvaged wood, antique mirror, and modern lighting in a way that felt fresh, approachable and relatable. Just like the brand. Peterson's style is classic yet she also appreciates modern, unexpected accents, so she says working with Jeremiah was a dream. "The environment he created is so timeless and modern at the same time," she adds. She loves how he effortlessly incorporated several centuries-old pieces, such as the iconic marble sink (where customers can test products) with natural elements like the beautiful crystals and clay pots along with the modern cloud lights from Apparatus Studio that brighten our front room. "It all comes together so beautifully," she adds. Since Peterson is in the business of making self-care products and celebrating the art of creating rituals, she sees the new store as a self-care sanctuary and hopes to inspire people to visit in person and experience the brand in a way they can't online. The skin clinic in-store will offer personalized facials, there's an aromatherapy bar where you can make custom perfume, and a lab for testing out all of the brand's products in person. With a commitment to sustainability in True Botanical's products, Peterson and Jeremiah wanted this thread to continue in store too. This can be seen in the wide use of antique furniture and reclaimed wood used throughout. The faux greenhouse solarium was particularly complicated, but Brent says it was important to introduce as much light as possible. "We wanted it to feel like natural daylight," he recalls. Even the color palette was pulled from the natural environment. In fact, Brent tells me every hue and material is directly pulled from the natural materials that are part of the ingredients of the True Botanicals products. Think rich lavenders and putty grays; each embodies a palette that is inspired by nature, which is the ultimate backdrop. Before Brent and his team got his hands on it, the space was originally very commercial, and corporate. So their biggest challenge was translating an entirely new identity. "We wanted to create a space that instantly transported you when you walked through the door," explains Brent. "I wanted the space to feel as though it had existed for hundreds of years and we threw modern life into it." Case in point, the 18th-century marble basin/sink from France. "We knew it had to be in the space," says Brent. "The clean lines and the history were the perfect juxtapositions to the sophisticated room. True Botanicals is rooted in ceremony and ritual, and this sink felt like it embodied those key principles. It is one of my favorite pieces I’ve sourced to date." The most exciting find was the 17th-century bookcase that houses most of the product. "Not only is it in beautiful condition but felt like such a fresh way to showcase the amazing product," he says. Now that it's complete, Brent truly loves everything about the space, but mostly the energy that's been created there in the process. "The space is so special, such a happy place," he says. "The True Botanicals brand has this fun, soulfulness to it, and we like that the space bolsters that."